From a geological Brexit study captured in clay, to student solutions to global humanitarian aid challenges, here is some quick-read news from across the College. 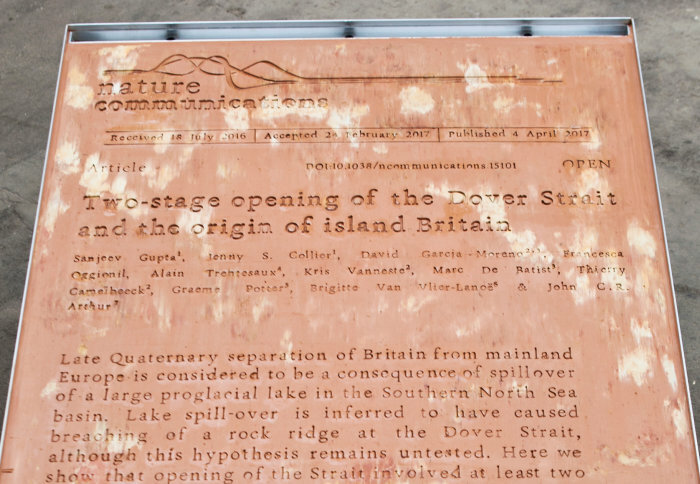 A Dutch artist has captured a Nature Communications paper by Imperial academics on Britain’s ‘ geological Brexit from mainland Europe ’, in wet clay. Lennart Lahuis is now exhibiting Professor Sanjeev Gupta and Professor Jenny Collier’s manuscript in clay format around Europe. Last year, Professor Gupta and his team discovered that the opening of the Dover Strait in the English Channel nearly 450,000 years ago occurred in two episodes, where an initial lake spill over was followed by catastrophic flooding. With colleagues in Europe, they described for the first time the details of how a chalk ridge in the Dover Strait, between Dover and Calais, was breached. In his presentation, artist Lahuis uses different forms of erosion to emphasise a multi-layered tension between integration and disintegration. Read Professor Sanjeev Gupta’s manuscript . Silk clothing, skin creams and insulin strips are among a raft of ‘low cost’ items prescribed by doctors which are set to end under new guidance from NHS England issued this week in an effort to cut the annual £9.2bn prescription bill. Responding to the move, Azeem Majeed from the School of Public Health says the proposal lacks bite, and lays the responsibility (and potential patient backlash) squarely with doctors. A better approach, he argues, would be for NHS England to legally remove the items from prescribing altogether, so saving frontline medics additional strain and avoiding ‘postcode prescribing’ for the items. The Department of Chemical Engineering’s Professor Andrew Livingston will take up the role of interim director of the Rosalind Franklin Institute , it has been announced. He is currently co-academic lead at the Institute. The Rosalind Franklin Institute, of which Imperial is a founding member, is a new national Institute for life sciences funded through UK Research and Innovation. It aims to develop novel interdisciplinary technologies drawing on engineering and physical sciences to advance the life sciences. Imperial’s Provost, Professor Ian Walmsley , also serves as chair of the Institute’s shadow board. Professor James Naismith, University of Oxford, will join the Institute as inaugural Director in June 2019. The UK is falling behind in respiratory health. Work published this week reveals a greater proportion of men and women are dying from lung diseases in the in the UK compared to a group of countries in Europe, Australia, Canada and the US. The work, led by Harvard’s Justin Salciccioli and Oxford’s Dominic Marshall – both former Imperial medicine graduates – looked at death rates between 1985-2015. They found that despite a downward trend over 30 years in all countries, the UK still ranks highest for deaths from all lung diseases, except lung cancer. A student society is looking to harness the creativity and innovation of Imperial students to solve global humanitarian aid challenges. The Friends of Médecins Sans Frontières (MSF) Society , with support from Imperial Enterprise Lab and the MSF Sweden Innovations Team, are launching a ‘Makeathon’ in January that will challenge Imperial students to come up with solutions to humanitarian aid problems that Médecins Sans Frontières face in the field. Médecins Sans Frontières, also known in English as Doctors Without Borders, is an international humanitarian organisation which works to save the lives of people in areas affected conflict, natural disasters and epidemics. Over a six week period, students will work in multidisciplinary teams to develop their ideas and create working prototypes at Imperial College Advanced Hackspace, with the support of mentors. They will then pitch their idea to a panel of judges. Sign up for our free quick-read daily e-newsletter, Imperial Today .